Whenever possible, our heart care experts use minimally invasive heart procedures to treat heart disease. 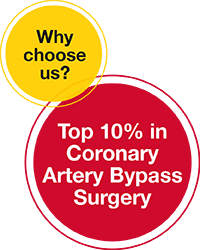 If your condition requires open surgery, our highly skilled surgeons have the expertise to perform even the most advanced heart and vascular procedures. An aneurysm is an abnormal widening or bulging out of a portion of an artery caused by a weakness in the wall of the blood vessel. Surgeons repair the aneurysm by removing the weakened area and placing a stent (an expandable mesh tube) in the artery to restore the vessel wall. An aortic dissection is a tear in the inner lining of your aorta, your body’s largest artery. Surgeons repair the area by replacing the damaged area of the aorta with a tube the same size as your aorta (graft). Traditional open-heart surgery requires surgeons to stop your heart during the procedure so your heart remains still and blood free. While your heart is stopped, a heart-lung machine takes over your heart’s function temporarily. With off-pump surgery, surgeons use a special device to stabilize the area that’s being operated on, allowing your heart to continue beating. This can help prevent complications, offer a quicker recovery, and shorten your hospital stay. Some procedures can’t be performed using this method, but our surgeons use this technique whenever possible. Heart bypass surgery restores blood flow your heart by using blood vessels from other parts of your body (called grafts) to reroute blood around a blockage. Our surgeons use minimally invasive techniques to gather blood vessels, which can help you recover more quickly. Mitral valve repair or replacement. Whenever possible, our surgeons repair your valve. When your valve is too damaged to repair, our surgeons can replace it with an artificial valve or a natural valve from human or animal donors. Aortic valve replacement. The aortic valve can’t be repaired, so it must be replaced with an artificial or natural valve. Maze surgery is used to treat irregular heartbeats (arrhythmias) called atrial fibrillation (AF), caused by a malfunction in your heart’s electrical signals. Surgeons make a series of small cuts (in a maze pattern) in the upper chambers of your heart (atria) and immediately close the cuts, which creates scar tissue. The electrical impulses that cause the arrhythmia can’t cross over the scar tissue, so the impulses must follow a defined path through your heart. This prevents the irregular electrical signals and restores normal heart rhythm.